William Ohly, London, and by descent to the present owner. G. Grigson, Henry Moore, London, 1943, pl. 14. H. Read, Henry Moore: A Study of his Life and Work, London, 1965, pl. 78. R. Melville, Henry Moore: Sculpture and Drawings 1921-1969, London, 1970, p. 9. G.C. Argan, Henry Moore, Milan, 1971, pl. 41. K. Clark, Henry Moore Drawings, London, 1974, pl. 104. Exhibition catalogue, Henry Moore, Madrid, British Council, 1981, p. 24, no. 150, illustrated. Exhibition catalogue, Henry Moore, London, Royal Academy, 1988, p. 213, no. 85, illustrated. A. Garrould, Henry Moore Complete Drawings 1930-39, Volume 2, London, 1998, p. 172-3, no. AG36.23, HMF 1259, illustrated. London, Leicester Galleries, Sculpture and Drawings by Henry Moore, 1936, catalogue not traced. New York, Museum of Modern Art, Henry Moore: Retrospective Exhibition, December 1946, no. 64: this exhibition travelled to Chicago, Art Institute and San Francisco, Museum of Modern Art. Sydney, Art Gallery of New South Wales, Exhibition of Sculpture and Drawings by Henry Moore, 1947, no. 20: this exhibition travelled to Hobart, Tasmanian Museum and Art Gallery; Melbourne, National Gallery of Victoria; Adelaide, Art Gallery of South Australia; and Perth, Art Gallery of Western Australia. Wakefield, Wakefield City Art Gallery, Henry Moore: Sculpture and Drawings 1923 to 1948, May - June 1949, no. 70: this exhibition travelled to Manchester, City Art Gallery. Paris, Musée d'Art Moderne, Henry Moore, 1949-50, no. 58: this exhibition travelled to Brussels, Palais des Beaux-Arts; Amsterdam, Stedelijk Museum; Hamburg, Kunsthalle; Dusseldorf, Stúadtische Kunstsammlung and Berne, Kunsthalle. London, British Council, Berkeley Galleries, Henry Moore Exhibition, 1949-50, no. 49: this exhibition travelled to Cape Town, 1952. Sao Paolo, British Council, II Biennale of the Museum of Modern Art, 1953-4, catalogue not traced. London, Arts Council, Tate Gallery, Henry Moore, July - September 1968, no. 179. Basel, Galerie Beyeler, Henry Moore Drawings and Sculptures, May - July 1970, no. 83. Munich, Staatsgalerie Moderner Kunst, Henry Moore 1961-1971, October - November 1971, no. 109. Florence, British Council, Forte di Belvedere, Moore Retrospective, May - September 1972, no. 205. Toronto, Art Gallery of Ontario, The Drawings of Henry Moore, November - December 1977, no. 113: this exhibition travelled to Japan Iwaki-Shi, Fukushima-Ken, Shimin Art Gallery Museum, January - February 1978; Japan, Kanazawa, Ishikawa-Ken, Ishikawa Prefectural Art Museum, February - March 1978; Kumamoto, Kumamoto-Ken, Kumamoto Prefectural Art Museum, April 1978; Tokyo, Seibu Museum of Art, April - May 1978; and London, Tate Gallery, June - August 1978. Madrid, British Council, Palacio de Velázquez, Henry Moore, May - August 1981, no. 150: this exhibition travelled to Lisbon, Calouste Gulbenkian Foundation, September - November 1981. London, Royal Academy, British Art in the Twentieth Century, January - April 1988, no. 85. 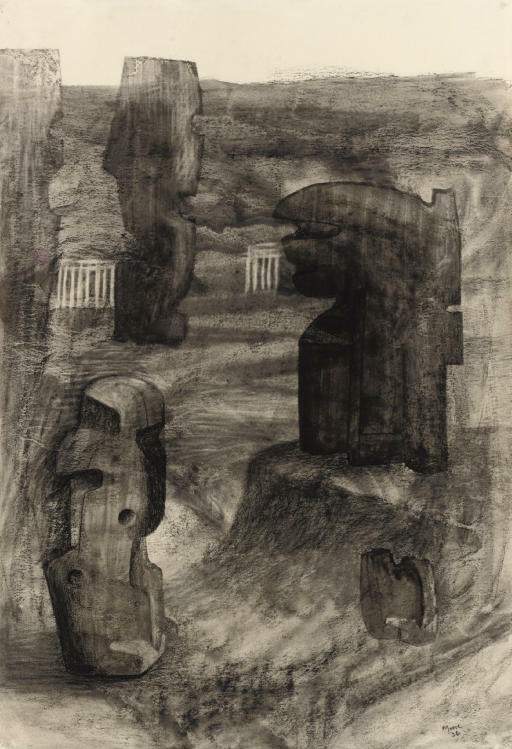 'In 1936 Moore made drawings inspired not only by the stones ready for carving that he had set up in his field in Kent, but by landscapes seen or imagined on the motoring holiday he had taken two years before in France and Spain. On that occasion he had been impressed by the deep valleys of the Dordogne and its prehistoric caves, a memory which contributed to another wash drawing of 1936, Figures in a Cave, (private collection). Thus, although the present work has been interpreted as Moore's first usage of a Greek temple motif, the sets of vertical lines topped by horizontals merely evoke that analogy in the viewer's mind: they could equally be interpreted as grids, or as a presentiment of the strings and wires that Moore began to use in his sculptures the following year. The stones themselves blend with the landscape for Moore has here created an effect like an old and faded photograph, very different from the contrast of black and green forms on a terracotta background that he had used the previous year, Stone Figures in a landscape setting, 1935, (The Henry Moore Foundation). In the 1930s Moore began to make use of photography to gain an idea of what small sculpture would look like if enlarged; there are black and white photographs of many of them seen against the open fields' (see Exhibition catalogue, Henry Moore, London, Royal Academy, 1988, loc. cit.). Clark refers to the landscape setting as 'a magnificent and unique example'. Before the decade had finished, Moore was to depict several sculptural objects set against a landscape (see A. Garrould, loc. cit).